Header: The header section contains values that help version and control the use of the product information contained within the file. Tick Tables: Tick Tables contain information on how different products can tick according to price levels. 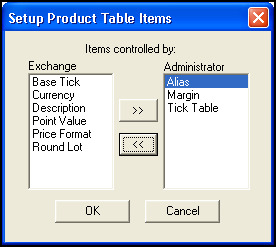 A product table can contain one or more tick tables. TT Gateway Information: This section consists of a single line. It defines and categorizes the remaining product table contents. Table of Products: The product information section contains parameters that Guardian uses to determine trading behavior and risk management. All product tables begin with a header section, which contains meta-data on the table such as update permissions, table version and sequence numbers, and the number of tick tables in the product table. Line 1: This integer is the version number of the product table. Its value is universal across all TT Gateways and changes only when TT reformats the structure of the product table. Line 2: This integer is the sequence number of the product table. Guardian uses this sequence number during product table replication to determine the most up-to-date information. Refer to Product Table Replication. Line 3: This integer is a bit mask that configures whether the exchange or administrator has permissions to update certain product attributes in the product table. Permissions can only be assigned to one entity at a time. Thus, if the administrator has the right to change a particular item, the exchange does not have permissions to change the same item. If you need to view or change update permissions, you can do so in the Guardian GUI. For details, refer to the procedure at the end of this section. By default in Version 7.X, the Administrator has permissions for all items except Product Name and Product Type. If you make changes to product table permissions, Guardian records this event in the bit mask. Afterwards, only Administrators can edit permissions (i.e., TT Gateways cannot edit permissions). In the Guardian product table view, grayed out columns indicate that only the TT Gateway has permissions to update the associated values. Line 4: This integer records the number of Tick Tables that follow Line 4. To access the Guardian GUI, in the System Tray, double click TT. For details on this procedure, refer to Performing a Guardian Admin Login. In the Tools menu, click View Product Table. In the Product Tables window, click Override. The Setup Product Table Items dialog box displays showing the exchange and administrator permissions. To switch a permission from one to the other, click the permission, and then click the arrow (>> or <<) that points to the account (Exchange or Administrator) to which you want to assign the permission. After changing your permissions, click OK.
Click Publish to save changes. Failure to do so causes a Warning dialog to appear when closing Guardian. If this Warning appears, click Publish Now to save changes and exit Guardian or click Not Publish and Lose Changes to discard the changes made to the Product Table Override. Guardian uses tick tables to determine how certain products tick according to price levels. To determine whether your TT Gateway supplies tick tables, refer to the specific System Administration Manual. For an example of how products tick in relation to tick tables, refer to the example in the following section called Tick Rows. If a particular product needs to tick according to the values contained in a tick table, you must map the product to the appropriate tick table in Guardian or by editing the product table (refer to Table of Products). Additionally, at times, the exchange can create new ticking schemas for products. When this occurs, you must add these new tick tables to the Product Table. TT recommends that you use Guardian to add tick tables to the product table and map products to tick tables. If you use Guardian to configure the Price field in a tick table, when writing the value to the product table, Guardian automatically multiplies the number you enter by 100 to account for decimals. For example, if in the Guardian GUI you enter 5 in the Price field, the Guardian GUI always displays 5, but your product table file contains the value 500. Each tick table has a table name row and one or more tick rows. The first line of any tick table contains the name of the table and the number of rows in the table separated by a semi-colon (;). CME-C01 is the tick table name. 2 is the number of tick rows that follow the table name row. All remaining rows in a tick table are tick rows. The Guardian GUI displays Price/Tick rows in the Product Tables window. The first integer in each row represents a price threshold, while the second value is a base tick multiplier. Whenever a product is mapped to the particular tick table and is trading at or below the first number in a tick row (price integer), the second number in the row represents the base tick multiplier for that product. The base tick is determined by dividing the product's Numerator attribute by that product's Denominator attribute. For further information on these attributes, refer to the section called Product Attributes. Whenever a product mapped to the tick table trades below 20000, its base tick multiplier is 5. Whenever the price rises above 20000, its base tick multiplier is 10. Additional tick rows represent different threshold levels between base tick multipliers. The highest available threshold is 999999999. The first line immediately following the last tick table is the TT Gateway information line. Exchange ID: The first integer is the exchange ID specific to the exchange-flavor of the TT Gateway that produced the product table. In the example above, the exchange ID is 92. For a list of exchange IDs, refer to Exchange Names. Exchange-flavor: The exchange-flavor of the TT Gateway that produced the product table followed by a semi-colon (;). In the example above, the exchange-flavor is CME-C. Number of rows: The last integer is the number of rows in the Table of Products. In the example above, the table contains 292 rows of product information. The last section of the product table file is its table of products. This table contains one or more lines of information specific to products that trade on the exchange to which the specified TT Gateway connects (refer to the preceding section called TT Gateway Information). For further details on the contents of the Table of Products, refer to the following section called Table of Products.